There is nothing like the intercession and support of someone who knows. Not only did MaryEllen give tactical support in the areas of queen identification, frame clean up, queen releasing, and sick colony retrieval, she let me use her stuff, too. Folks, this is a proper double screen board, a divider between two groups of bees that lets them share a queen's pheromones without allowing them to do battle. MaryEllen made this herself, and a darn clever business it is. 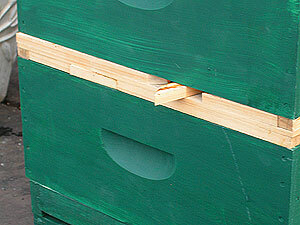 On the right is a little swivvelling hive entrance that allows the nuc of bees (the ones with the new queen) to enter and exit on the opposite side from the bees in the "laying worker" colony below: this minimizes bee battles before the potential unification. MaryEllen built these groovy entrances on all four sides of the board, and on top and bottom (8 in all). They look great and SHE DID NOT USE A PATTERN. 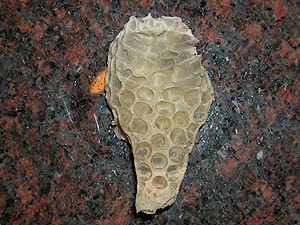 This is an actual queen chamber, a lot different from the drone comb in the other pictures. It came from Colony 2, and was never occupied (apparently they just make these things sometimes. It hung down (vertically) the front of the frame it came from. 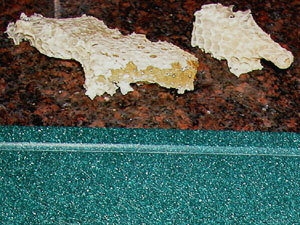 On the right is a bowl of honeycomb that needed to be scraped from some frames of burgeoning Colony 2. This is the first harvest, in a way, though it is the result of a mistake and should not have happened. 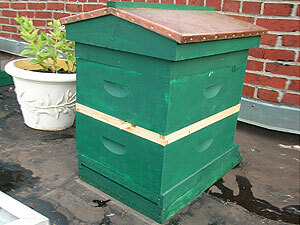 Another view of the honeycomb and the queen chamber, where the bees might have reared a new queen for Colony 2 if they had deemed it necessary. 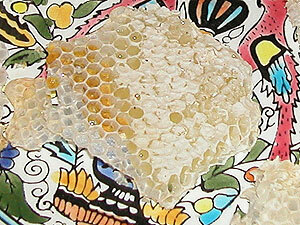 On the right, a closeup of some honey. 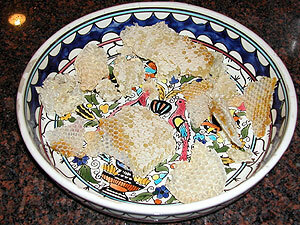 Apparently the girls produced very white beeswax and perfect cappings to the honey cells (they have been knocked around a bit by the time this photo was taken).